Electron: 0.5Mev… Proton: 1Gev… Higgs: 125Gev? 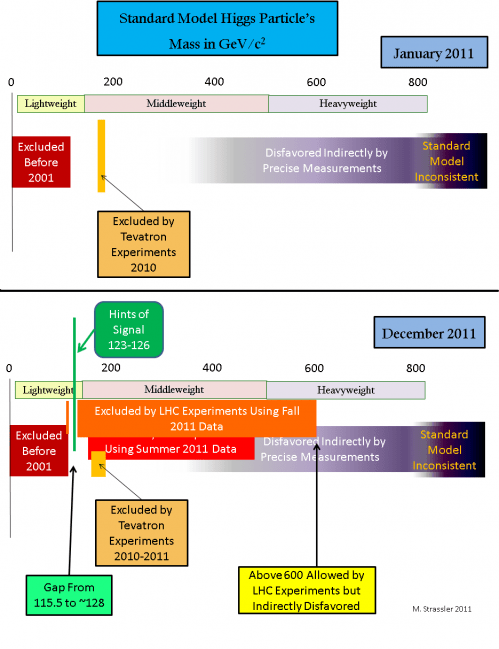 In a related post he noted both the hints in recent data that suggest there could be a single Standard-Model Higgs particle, but also some of the contrary evidence: cross-sections of the data which should show the same signal but do not, or hints that there might be something more complicated going on. 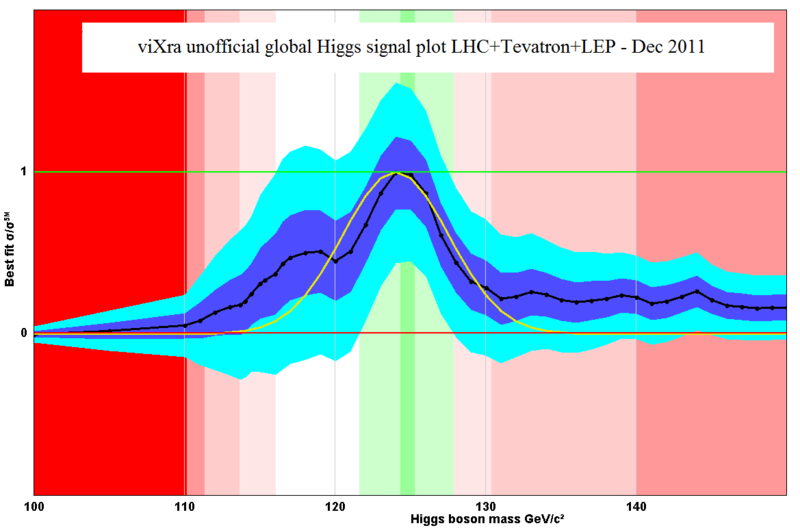 In contrast, Phil Gibbs of viXra (an alternative to arXiv.org requiring no peer vetting) offers a deceptively neat faux distribution of observations, optimistically combining data from different experiments and suggesting the result likely corresponds to a single Higgs-like particle massing around 125Gev. Note how more jargon is used here, and less historical perspective; with a focus on coming up with The Answer, rather than providing a broad picture. Then there are physicists who take this opportunity to promote their own pet theories, quickly publishing preprints that suggest those theories predicted this all along — subtlely modifying their past work to hone in on the remaining possible energies for a Higgs particle. Strassler’s approach is universally useful. It teaches others about this particular experiment, about the field of particle physics, and about how to do science. Gibbs’s approach is a quick hack, of temporary value in the current discussion, but gives a limited understanding of the state of research and may give the wrong idea about how to analyse and interpret research. Scientists trying to ride the coattails of a pending discovery often have received no new information about whether their ideas are right or wrong. To show their work in the best light, they misstate the current understanding of their own field, give students a harmful model to follow, and damage the public understanding of what science does and how to understand it… in addition to possibly promoting ideas that are simply wrong. Jonathan Harris is a reimaginary nomad hacker artist storyteller. cowbird is his work of inspiration – the kind once ascribed to a muse reaching through the artist. it may change the way you see.